Beneath the make up and exotic costumes, David Bowie was also the intelligent, politely spoken suburban young man who you could potentially introduce to your mother. For more than four decades, David Bowie has entranced his followers. As he releases his first new material in ten years, Samira Ahmed looks at his particular appeal for British Asian women. Across the generations, they have been inspired by the skinny South Londoner who challenged gender barriers and who played with alien identity and other worldliness. Beneath the make up and exotic costumes, he was also the intelligent, politely spoken suburban young man who you could potentially introduce to your mother. As Samira explores Bowie's impact on British Asian teenagers, she talks to Shami Chakrabarti, the Director of 'Liberty', about Bowie's changing identities. 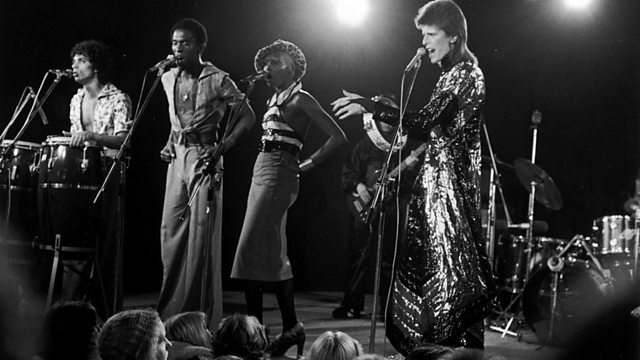 Sociologist Rupa Huq tackles his suburban psychoses and Shyama Perera takes Samira on a journey to explain how her teenage obsession with Bowie even extended to sending costume designs to her hero - arguably enabling her to claim that "I dressed Ziggy Stardust". The 40th anniversary of The Rise and Fall of Ziggy Stardust and The Spider from Mars. Is David Bowie the 'Steve Jobs of pop'? BBC Arts Editor Will Gompertz investigates.